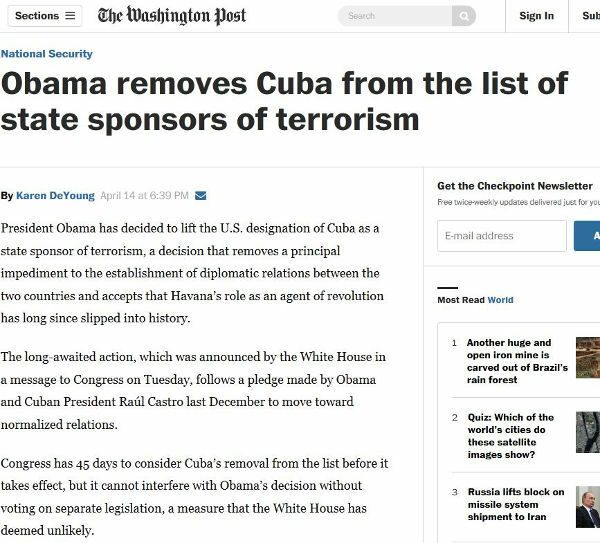 In a sign of the quickly warming relations between the United States and Cuba, American President Barack Obama has removed Cuba from the list of state sponsors of terrorism. This move comes on the heels of a historic weekend meeting between President Obama and Cuban President Raul Castro at the Summit of the Americas which was held in Panama. The change in designation did not require any action from the United States Congress and was driven by the President, based on recommendations from the US State Department. The two American political parties tend to be divided on this issue with the Democrats in favour while a lot of Republicans would prefer a continuation of the hard line against the communist Cuban regime. So this change in designation will be used for domestic political purposes. It is unclear what recent terrorism activities have been supported by Cuba but the long standing sanctions, embargoes and this designation have been in place for decades (terrorist sponsor designation was put in place in 1982 at the height of the Cold War). “Our hemisphere, and the world, look very different today than they did 33 years ago,” Secretary of State John F. Kerry said in a statement. While problems including corruption, violence and drug trafficking remain, every country in Latin America — except for Cuba — has a democratically elected government, and the violent leftist revolutions that once racked the region have long since petered out. Cuba’s removal would leave only three countries on the list: Iran, Sudan and Syria. In a brief statement issued late Tuesday, Josefina Vidal, the director of U.S. relations at Cuba’s Foreign Ministry, offered guarded praise for the move. “The government of Cuba recognizes the just decision made by the President of the United States to remove Cuba from a list on which it never deserved to belong,” she said.